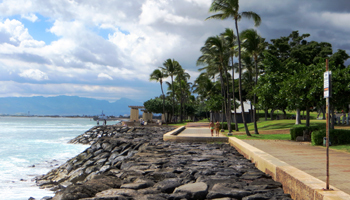 Kakaako Waterfront Park is Worth Mentioning among Oahu Beaches. 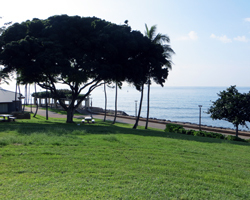 Kakaako Waterfront Park: A Sort-of Honolulu Beach! Though it’s not exactly a beach – due to the total lack of sand – Kakaako Waterfront Park at least deserves an honorable mention among the Oahu beaches because it sits on the seashore, it’s a good place to enjoy outdoor Hawaii activities, and the surf there is fun for experienced wave riders. It’s also a great place to get some exercise, have a picnic, watch the sunset, enjoy an after-dinner stroll, and my favorite: go ice blocking. Due to the easy access from everywhere in downtown, this has been a popular Honolulu hang-out since it first opened in 1992. 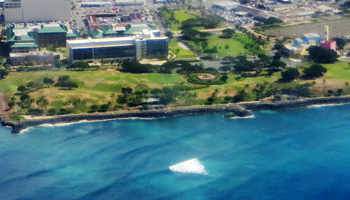 Named after the surrounding Kakaako (kah-kah-ah-ko) area of Honolulu, and sometimes also called Point Panic Beach (for the bodysurfing break located just off-shore), this popular park used to be a landfill. 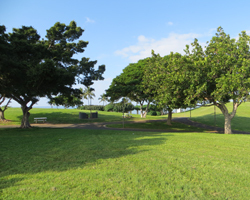 But it was reclaimed, repurposed and reopened to the public as Kakaako Waterfront Park – which I guess makes this one of the “greenest” parks in Hawaii. And don’t worry about the landfill… it has been closed since the 1960’s. So unless someone has been littering, everything should be fresh and pleasant. 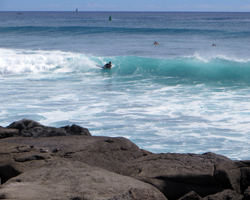 If you’re experienced and competent in the water – meaning you know how to keep yourself from getting thrown onto the rocks and mangled – then you might enjoy wave riding at Kakaako Waterfront Park. There’s no lifeguard on duty here, so you have to be capable of handling yourself. The break on the very eastern tip of the park (on the edge of the boat channel into Kewalo Basin Boat Harbor) is called Point Panic and is reserved exclusively for bodysurfers. However, when there are no bodysurfers in the water, body boarders and surfers are welcome to give it a go. Body boarders get the next preference, and they will usually ride the waves breaking to the right. Surfers then get the leftovers, which means they’ll usually be riding the waves that break to the left. When the conditions are clean, this can be a really fun little break – though the rides are often fairly short due to the looming rock wall that’s quickly getting closer. There are two or three other surf breaks crashing into the rocks at Kakaako Waterfront Park; and those are open for any form of wave riding. Just keep in mind that there are often fishing boats in this area. And fishing boats often trail chum (whether intentionally or not). And sharks like to follow a trail of chum. Don’t be chum. Keep your eyes open. If you see any threat, get out of the water. I think everybody who has ever surfed here knows stories about a large tiger shark that patrols the area. Unlike almost everywhere else in Honolulu, there’s sufficient parking at Kakaako Waterfront Park – and it’s free! It’s also directly next door to the Children’s Discovery Center. Thus, for a full-day of fun with the kids, you could go to the discovery center, then have a picnic in the park and let the kids run up and down those hills for a couple hours. They’ll sleep great that night (which might be exactly what you need if you’ve got to catch an overnight flight back home). 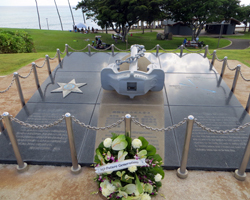 Also within the park, there are two memorials – the Victim Memorial (sponsored by Mothers Against Drunk Driving) and the Ehime Maru Memorial (to commemorate the 2001 accidental sinking of a Japanese fisheries training vessel by a U.S. Navy submarine – just nine miles off shore). There’s also an amphitheater where concerts are sometimes held. My only real complaint about his park is that the pavilions were built without roofs. So you get there and grab a table under a pavilion expecting to find shade or shelter from the occasional drizzle, but PSYCHE! Fooled you. What looks like a roof is just a bunch of eaves. You’d actually be better-off finding a tree under which to hang-out. Finally… I’ll just mention that the area outside the entrance of the park has recently been settled by some of Hawaii’s homeless population. Although you’ll likely see some of these less-fortunate individuals as you drive past, you probably won’t have any reason to worry about a direct encounter. Nevertheless, if homelessness is not the image you want to remember from your Hawaii vacation, you might want to choose one of the other nearby south shore Oahu beaches. Disclaimer: Stupidity and carelessness can kill you. Heed posted warning signs. Use your brain and take responsibility for your own safety. Know the limits of your ability and stay within them. Watch your children carefully at all times. I’m not recommending this Hawaii attraction. I’m simply giving you information about all Oahu tourism activities. The decision to experience anything I’ve described is your own.